Traditional soaps and skin cleaners frequently contain a long list of ingredients, some of which are known skin allergens and irritants. If you are sensitive or allergic to your soaps or cleansers, look for products that have fewer detergents and other chemical substances. These products are less likely to cause allergic or irritant contact dermatitis and other sensitive skin conditions. When you're shopping for hypoallergenic skin products, it's easy to get overwhelmed by the claims of manufacturers and the complicated names of ingredients. Understanding how to identify these products can help. 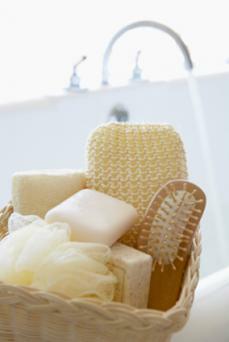 Many modern soaps and cleansers are not the traditional soaps of the past, made with just an oil and an alkali. Instead, they are made with additional harsh detergents, dyes, fragrances, and other additives that are more likely to sensitize your skin. Plant-based oils, such as pure virgin olive oil or coconut oil - These are less likely to clog skin pores and cause irritation. Colloidal oatmeal - This has natural saponin to create foam and lather. Glycerin and other natural moisture barriers - These help the skin retain its moisture. Plant extracts and essential oils are added as fragrance or antioxidants but can cause adverse skin reactions if you have sensitive skin or skin allergies. Animal fats, such as tallow (beef) and lard (pork), can block pores and cause acne and irritate sensitive skin. Additional fats such as lanolin, paraffin, mineral oil and stearic acid can moisturize and form a protective skin barrier, but too much can clog pores and cause acne. Water softeners such as tetrasodium EDTA and relatives tetrasodium etidronate and pentasodium pentetate can irritate eyes, skin and lungs. Preservatives such as Butylated Hydroxytoluene (BHT) and methylisothiazolinone, or parabens, (such as propylparaben), can irritate the skin and eyes and are toxic to cells. Propylene glycol is used as a detergent and emulsifier to make the dyes and perfumes blend better, but it can cause eczema and other skin conditions. Other harsh, synthetic detergents, such as cocamidopropyl betaine, sodium dodecylbenzene sulfonate, sodium laureth sulfate and sodium lauryl sulfate, can irritate skin. Some of these products include synthetic detergent (syndets) bars, said to be mild. However, these can cause skin reactions because they contain sensitizing ingredients. Some "hypoallergenic" products only lack the fragrances or dyes but still contain irritant and allergenic detergents and preservatives. Other products labeled fragrance-free only add a substance to mask the scent. There are products not labeled "hypoallergenic" that may work for you. These fit the criteria of fewer, milder or natural ingredients, so they are less likely to cause skin reactions. Even products that have fewer or milder ingredients can still cause a skin reaction because the body's immune response is complex and unpredictable. "Dermatologist tested" or "dermatologist approved" are also meaningless labels. Look beyond the marketing claims and labeling and carefully read the list of ingredients before you select a soap or cleanser. Note that even with careful selection based on the science of the ingredients, you can't tell that a milder product might cause a skin reaction until you use it. Not every soap and cleanser labeled "hypoallergenic" or "natural" is, in fact, hypoallergenic. The following products are recommended because they contain fewer and/or milder ingredients than their traditional counterparts, or they contain natural ingredients. They are more likely to be hypoallergenic even if they don't carry the label. Some of these milder soaps and liquid cleansers are recommended by doctors for people with skin conditions, such as atopic dermatitis (eczema), psoriasis, rosacea and acne. You can find these hypoallergenic soaps and skin cleansers in supermarkets, pharmacies or through online sources. 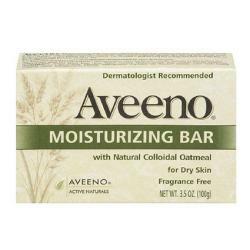 Aveeno Moisturizing Bar is a good option for eczema, psoriasis and other skin conditions. This soap is made from colloidal oatmeal, castor oils and other vegetable oils. It also contains natural antioxidants, vitamin E and flavonoids, and it has glycerin and other moisturizers added to counteract the drying effect of the oatmeal. It contains no dyes or fragrance. A 3.5-ounce bar costs just under $3.50. Olivella Face and Body Soap and the fragrance-free version are all-natural soaps that contain pure virgin olive oil. They use a fatty acid made from the olive oil, sodium olivate, to lather the soap. There are also natural antioxidants and vitamins from the olive oil, as well as essential free fatty acids, which have anti-inflammatory properties. Glycerin is a moisturizing agent, and there is little or no fragrance and no dye. A 3.52-ounce bar retails for $2.75. 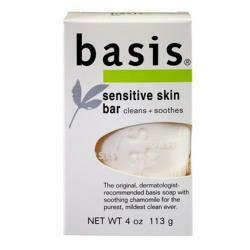 Basis Sensitive Skin Bar is also physician-recommended for eczema and acne and contains aloe vera, chamomile, almond oil, glycerin and other moisturizers. It has no dyes or fragrances, and the main ingredients are derivatives of coconut and palm kernel oils. However, it does contain tallow fat and petrolatum, which can clog pores and cause acne. A four-ounce bar costs just under $3. Dr. Bonner's Unscented Baby-Mild Castile Bar Soap contains coconut, palm, olive, hemp and jojoba oils. It also includes citric acid, sea salt and tocopherol (vitamin E). It has a natural, mild scent. A five-ounce bar retails for less than $5. Kirk's Original Coco Castile Soap contains coconut oil and glycerin. It doesn't have any fragrance, dyes or synthetic detergents. A package of three three-ounce bars retails for just under $3.50. Aveeno Active Naturals Skin Relief Body Wash is formulated for sensitive skin and contains colloidal oatmeal, vegetable and castor oils and glycerin as moisturizer. It has not added fragrance, dyes or soap. This mild option retails for $8.00 for a 12-ounce bottle. 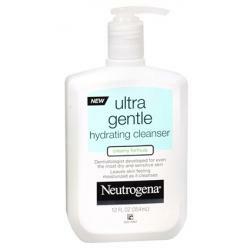 Neutrogena Ultra Gentle Cleanser, recommended by dermatologists, is soap-free and fragrance-free. It's made from castor oil and contains chamomile and vitamin E. The lathering agents are said to be gentler and less allergenic than traditional agents, and it contains no detergents, parabens, sulfates or dyes. The daily cleanser version contains fragrance. A 12-ounce bottle costs around $9. The Olivella Face and Body Liquid Soap cleanser is made of similar ingredients as the bar soap. A nine-ounce bottle costs just under $11. Dr. Bonner's Baby-Mild Castile Liquid Soap contains coconut, olive, hemp and jojoba oils, as well as citric acid and tocopherol (vitamin E). An eight-ounce bottle costs under $7. Many soaps and skin cleansers are labeled hypoallergenic yet contain known allergenic substances that can sensitize the skin. Look beyond the marketing appeal and avoid products with multiple, hard-to-understand ingredients, which may be allergens and irritants and and toxic substances. The list of ingredients can be puzzling, but read the product labels carefully to protect your skin.